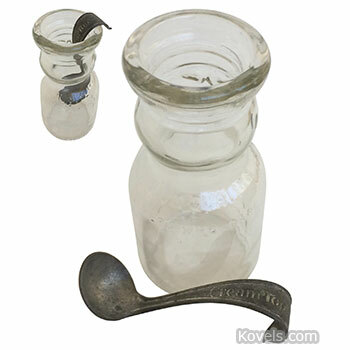 The glass item is 5 7/8 inches high and the utensil is 4 inches long. Yes rccrusher is right on the bottle and spoon. The baby cream bottles are hard to find. I collected old milk bottles and the cream spoons. Started selling my collection off after they started reproducing the bottles and spoons which look so original. So watch out on the spoons for reproduction ones. This was NOT used to LADLE out the cream. The bowl of the spoon would cover the opening between the milk and cream. The handle curved over the top of the bottle and held. Then the cream could be poured out into a separate cream pitcher. They used to bottle whole milk in this bottle shape. The cream would rise to the top and the little ladle was for getting the cream from the top of the bottle. It’s a cream-top bottle and spoon. The bottle reads, “Brookfield Dairy, Hellertown, PA, Phone Te8-3041, Baby Top Patent Design No. 98609, Half Pint Liquid” On the back of the bottle, “Premium Quality, Mothers Who Care, Registered Sealed (R).” The bottle is 5 7/8 in. high. The cream top spoon is meant to scoop out the cream that rises to the top of the bottle. It’s marked “Pat Sept 2nd 1924, Mar 3rd 1927” and is 4 in. long. The spoon is marked but the bottle seems too small for a milk bottle. Yes, I grew up in the 1950's in Michigan and remember the cream topped quart size bottles. Fun in the winters when it would freeze and pop the cardboard seals. This looks more useful as something to feed baby's food before Beechnut took over the biz. When I first looked at this item, my thought was that it was probably a jug/bottle that separated the cream on the top from the milk in the bottom section. After scrolling down, I see that the rest of you thought the same thing. Fun trying to guess. That is indeed a CreamTop milk bottle and cream spoon/ladle. I have one of each that were given to me by late mother-in-law. I remember growing up in Ontario, Canada in the 50s. The milk bottles delivered to the house had cream on top that could be spooned out. The bottles were much larger than the one displayed here and no spoon. Cream Top Milk Bottle w/ spoon. My husband is from N.J. and he talks about spooning the cream off the top of the milk. He would love to have a milk bottle from his old dairy and a spoon! Great collectible! That is a Cream Top Milk Bottle with it's Cream Spoon! I have a Cream Top Milk Bottle I was trying to get a value on yesterday. So wish I had the spoon, my mother remembers having one in New Jersey when she was a girl in the 1930's.